A fascination with the macabre, such as human bones and skulls have allured folks through the centuries. It is not surprising that objects in the likeness of skulls have become familiar and almost “endearing objects” these days and now grace our homes. Almost like an “old friend”… "Alas, poor Yorick! I knew him well." Comes to mind when you see a skull (of any size) perched atop a bookshelf, doesn’t it? 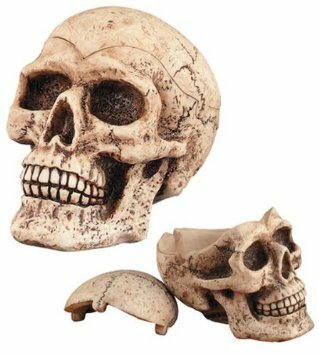 Of course a real life size version might be a bit frightful to have about so we offer this hand color washed Miniature Skull sized just right to satisfy your inner dark side without terrifying the neighbors!….